Dr. David Katz likens obesity to drowning in highlighting the need for both personal responsibility and public empowerment. I’m all for choosing both whether the issue is protecting kids from obesity or from drowning. In today’s guest post, Anita Reid offers suggestions for how to keep children safe around swimming pools. Swimming is the perfect summer pastime for both children and adults. The warm weather gives you the opportunity to spend quality time with your family while you take in some well-deserved sun and poolside lounging. Despite this, there are numerous hazards that lurk around swimming pools. Making sure that your pool is safe is the most important step in getting the most enjoyment for you and your children. And by implementing some fundamental rules and procedures around your pool, you can maintain its safety. Although swimming pools can provide lots of enjoyment in the summer, it’s also a place where serious accidents can occur. 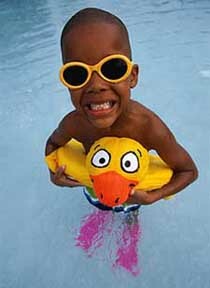 Young children are especially at risk around pools. Sadly, statistics show that drowning is one of the most frequent causes of death in children aged 0-5 years. In addition, falls result from slippery surfaces, while unsafe diving can lead to unnecessary injuries. Implementing safety measures and having the right supplies in place can easily prevent drowning and injuries around the pool. The most important step for pool safety is educating your kids. By learning and effectively teaching your children how to use the pool safely, you’ll be setting a foundation for a lifetime of swimming enjoyment. Teaching your children how to swim as early as possible is the greatest lesson you can give them to ensure their safety around swimming pools. Swimming lessons teach them how to use the pool appropriately to prevent injuries. You can reinforce their education with signs that use visuals to clearly define the expected behavior at the pool. A CPR sign can also provide immediate and valuable information for emergency situations. Most importantly, CPR is one of the most important skills you can learn as a parent. It gives the security of knowing exactly what to do in an emergency and could help you save a life. Take the time to get certified for the sake of you and your family. The most basic safety measure you can take for year round safety is to have a fence around your pool. s fence should measure at least 1.5 meters (5 feet) high, and have a door for pool access that can be locked. Objects that can be used to climb over a fence should be removed to prevent curious children from getting into the pool area. Check the perimeter throughout the year to make sure it hasn’t been compromised in any way. This is a quick way to keep your pool safe through the fall and winter months. A winter safety net will give you even more security in the off-season. Your fence is not completely foolproof, so having a barrier that prevents access to the water gives you additional peace of mind. It prevents accidents while keeping your pool clean from debris throughout the year. A pool alarm can be used to alert you when any of your children enter the pool area. Interior and exterior alarm installation should be used for maximum safety. Ultimately, no method guarantees complete safety. The best approach is to use a variety of methods to create the safest environment for you and your children. A pool safety checklist app can be found here. Keeping a close eye on your children at the swimming pool is fundamental to their safety. In addition, putting these safety measures in place provides even more security for you and your family. Swimming education and life-saving skills such as CPR are an important foundation for lifetime pool safety. You can use signs that influence how children behave while reinforcing what they’ve learned. You use your pool in the summer, but you should also keep it safe in the winter (see infographic). By taking these important steps, you can make sure that your family gets the most enjoyment from your pool. More importantly, you’ll have the peace of mind to enjoy the summer season with your children. Anita is a mother of two wonderful girls, a wife and a breadwinner. In her free time she loves to take her girls wherever their hearts desire; or when she’s alone, she enjoys riding her bicycle, especially in nature. Tags: Pool Safety. Bookmark the permalink. Enjoying your blog, as always.